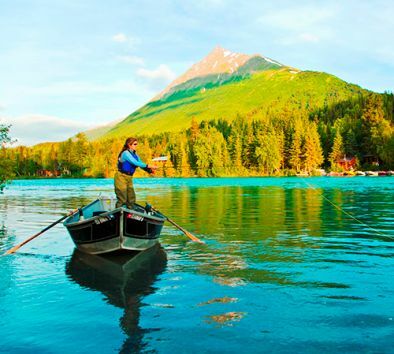 Relax for a few hours and go fishing for sockeye and Coho salmon (depending upon time of year), Dolly Varden and rainbow trout (all season, catch, photograph and release) in the upper Kenai River—one of the most productive trophy fishing waters in Alaska. This tour is perfect for all levels—there are river sections for both the beginner and the experienced. The turquoise water of the Upper Kenai River runs 17 miles through the Chugach National Forest and Kenai National Wildlife Refuge. Its entire length is the spawning ground for millions of pacific salmon. Fishing licenses are required for anyone 16 years of age or older. Licenses are available for purchase at the lodge upon arrival night—bring cash. Space is limited so booking early is recommended. Dress in warm layers. Bring a jacket, hat, gloves, warm socks and sunglasses. All fishing gear, a snack and beverage are included.